My sophomore year of High School signified the end of my public school education and a new beginning in the way I viewed the world around me. At Salem, I learned that I was not as smart as I thought I was. I went from making straight A’s with minimal effort to straight D’s on my report card. I was so accustomed to skimming through pages to find answers without actually reading anything. At my public school, I was often able to accomplish this between classes. But at Salem, we dove deeper. My teachers called on me even when my hand was not raised. They didn’t want to know WHAT I read, they wanted to know what I THOUGHT about what I read. That is when I understood that CliffsNotes do not actually evoke much powerful thinking. I began learning to read.. REALLY read. While we read all the classics including The Scarlet Letter and Animal Farm, we also enjoyed female empowering novels like What Girls Learn by Karen Cook and Beloved by Toni Morrison (one of my favorites). We also read books that challenged our views of the world like There Were No Children Here by Alex Kotlowitz. We were taught to stand when someone older entered the room and to ask to be excused from our table at lunch. On a stage, we were expected to sit with our right ankle crossed over our left and to offer respect to upper classmen. 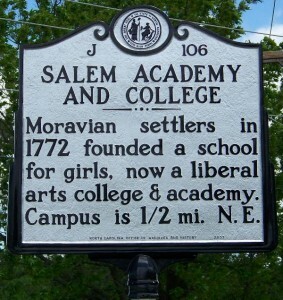 Salem Academy is located on an adjoining campus to Salem College so we also got to experience walking across campus to different buildings and purchasing our books from the college bookstore. We were expected to form clubs and do volunteer work within our community. And while I did begin to notice that most of these girls were in a socioeconomic class far different from my own, I could relate to them in every other aspect. 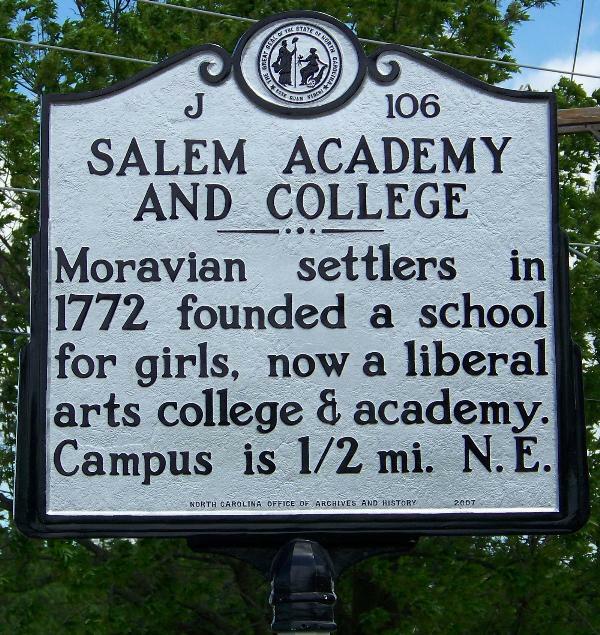 Like many private schools, Salem required us to study both the Old and New Testaments of the Bible to graduate. But, we studied this in such a unique way. I can remember our pastor (who was Moravian) taking us out to the front lawn on warm Spring days and instructing us to get comfortable and close our eyes as he read the passages to us. We were given free rein to interpret these passages on our own before being corrupted with any specific opinions. Then, without any judgement, our instructor would go through each passage and explain to us how people all over the world of varying faiths interpreted them differently. We were never pushed in any direction but encouraged to decide which path we most identified with and to explore it. It was like Heaven to me. After all, in my hometown, if you are Liberal you simply can not be a Christian. Salem taught me that this is absolutely NOT true. I also learned the value of Art, Music and Traveling at Salem. About half of the students actually lived on Campus. Some spoke English as a second language and many had experienced life in other parts of the world. 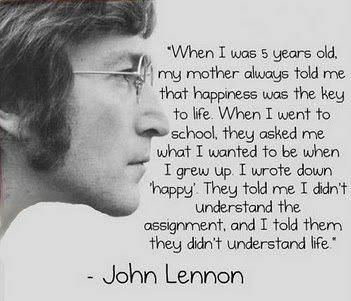 We were all encouraged to pursue Art, to play instruments, to perform in theater or to join the Glee Club while also focusing on sports and healthy living. In High School, theater was my niche. I loved getting up on stage, blinded by all the lights and performing as if no one and everyone were watching all at once. I liked serious, thought-provoking monologues and had a blast doing improv. Once I performed in a Musical production of Alice in Wonderland. I was the Duchess and had a lovely little pig baby to call my own. All the girls around me were so driven and talented. We were involved in every aspect of the production from the actors, to the pianist, to the costumes and the make-up. We even designed our own props. I even had the opportunity to study set design in the Wake Forest theater department as part of a month-long internship. I felt at home around my Salem sisters. I was in love. Soon I was falling in love with everything. Friends, guest speakers, books, art and theater and music. Heck, I even enjoyed the long division required in my Advanced Algebra and Trigonometry class! But, as we all know, opening your heart up to love is a double-edged sword and soon all that joy inside of me started to change into something else. By graduation time, all of my friends were heading to well renowned schools all over the world. They had intentions of becoming CEOs, lawyers, doctors and entrepreneurs. They had plans and goals. They knew who they wanted to be. For me though, the answer to, “what do you want to be when you grow up?” was fleeting and elusive and lead to a series of failures that were nearly impossible to overcome, but I did. I loved reading this, Bailey, and look forward to more! Love seeing things my Salem Sisters do! The last part about a series of failures that were impossible to overcome but you have really hits home with me. I too have had a series of “failures” and have overcome impossible odds. I think you could tie this back to Salem, I know they helped mold me in to the strong person I am today.